The Alamo City is home to our nation’s second-largest concentration of cybersecurity experts—and growing. Over 1,000 of those industry professionals are based in Port San Antonio’s large campus—a proven strategic partner to the region’s cyber community. Our customers serve defense and private-sector operations, including banking, aerospace, medical and other industries. In close collaboration with our customers and partners, we’re growing an environment where cybersecurity is thriving as it captures opportunities in our region, across the country and around the world. More than 1,000 cybersecurity experts—uniformed and civilian—are employed by the Air Force within the Port San Antonio campus. Cybersecurity operations at the Port are anchored by the national headquarters for the Air Forces Cyber, also known as the Cyber Command. Here, hundreds of uniformed and civilian personnel protect the integrity of the Air Force’s IT assets around the world. Private-sector firms are also growing at the Port. They’re here to support Department of Defense cyber operations on our campus and throughout the region as well as a growing private-sector clientele. Our 1,900-acre campus is the single-largest commercial property in the region. And we have plenty of room for growth. We’re within 2 to 20 minutes driving distance from other major technology hubs, including the 24th Air Force, Lackland Air Force Base, downtown San Antonio, the city’s medical center and major area manufacturers. Available spaces for start-up and established cybersecurity operations range from 4,000 to 32,000 square feet. Our Technology Building in the heart of our campus is now completed. The 90,000-square-foot modern facility is specifically designed to meet the security and telecommunications needs of the cyber community. Spaces begin at 2,500 square feet. The project is part of a multi-building complex to support cybersecurity and other advanced technology operations. 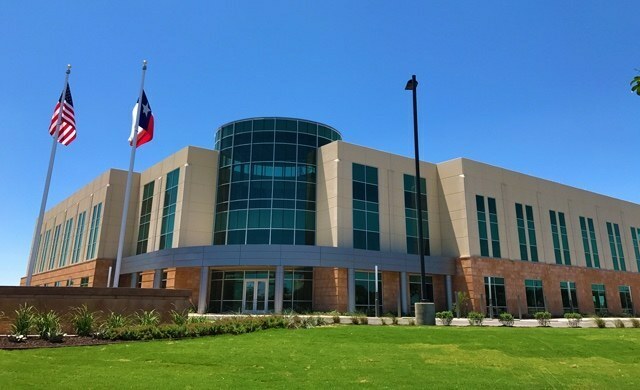 Port San Antonio’s newly completed facility to host additional cybersecurity and other advanced technology operations. The upcoming facilities for additional tech-sector firms at the Port would be built close to a vast Department of Defense complex, informally known as Lackland Annex. A global center for cybersecurity excellence begins with world-class educators. Alamo Colleges — The region’s community college district, with an array of information technology degree and certificate programs. Alamo Academies—Part of Alamo Colleges and based at the St. Philip’s College campus neighboring the Port, the nationally-acclaimed dual-credit program provides college-level training to top high school students in advanced technology, including cybersecurity, aerospace and advanced manufacturing. Hallmark University — An innovative San Antonio-based nonprofit university whose curricula are aligned with industries’ needs. Offerings include a bachelor’s of information technology with a concentration in cybersecurity as well as other degree and customized certificate programs. For nearly 20 years, our mission has been to serve as a big economic engine for San Antonio: Our success is directly measured by our customers’ success. To achieve this, our in-house team of business development professionals works hand-in-hand across our industries to support their growth strategies, including identifying and pursuing new markets. We also collaborate with many local partners who share our passion to grow San Antonio’s standing as a top destination for cybersecurity operations and innovation.